Though it still feels like college wasn’t that long ago, my friends and I are now all closer to 30 than we are to 20. 30 seems like a big milestone. Right now, we’re still exploring, still jumping between jobs, still trying to decide “what we want to do when we grow up.” But by the time you turn 30, you’re supposed to be an adult, right? Steady job, living on your own, building a family, all that good stuff? What are some things you want to accomplish before turning 30? Here’s my list. I want to read the Bible through again. My father and I read through the Bible together when I was 18, from Genesis to Revelation. It was sort of a “sending me off to college” thing. He wanted to equip me before I went off to college and entered the big bad world. And the best way he knew to do so was to give me God’s Word. I read the Bible through again some time after graduation, as I was starting a new stage in life. As I pass through different stages of life, I’ve realized more and more that God’s Word really does have answers to any question we might have. Often the Bible does not tell us directly what we want to know (“apply to this job and not that one”), but God has given clear and sufficient guidelines on how to live. 2 Timothy 3:16-17 says, “All Scripture is God-breathed and is useful for teaching, rebuking, correcting and training in righteousness, so that the servant of God may be thoroughly equipped for every good work.” The Bible thoroughly equips us for every good work, in whatever circumstance of life. Before turning 20, I want to read God’s Word in its entirety again, maybe even multiple times, because I know there is no better preparation for a new phase in life than to read and re-read God’s love letters to us. During my college years, I loved it when others invited me over for dinner. Of course, being fed is always great. But there was also something restful about being in a home, after so many hours spent in our transient dorms. When someone invites me home for dinner, they are inviting me into their lives in a way that just doesn’t quite happen at a restaurant or a coffee shop. Oh, and the conversations we had, lingering late into the night over the dining table after a wholesome meal! I want to share that with those around me. By the time I’m 30, I hope I’ll have at least a basic set of life skills: cooking, budgeting, cleaning the toilet. And I hope that I will be learning to use these skills in service of others. It won’t always be easy. Some of us live in small apartments. Some have roommates. Right now, my husband and I are temporarily staying at my parents’. But hospitality is not a fancy dinner (Proverbs 15:17). It is about sharing what we have with others, because we know that Christ gave His all for us. 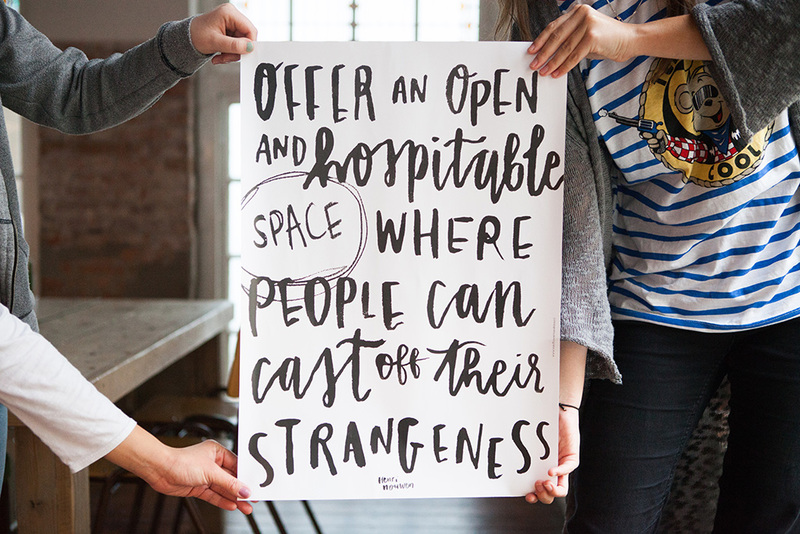 Opening up our homes for others draws them close, tells them that they are more than strangers, that they matter. Christ has invited us into His family. Let us do likewise, and invite others into our lives by the simple act of cooking them a meal, perhaps through that we can share the feast of God’s love with them as well. I am in the process of settling in a new church because of a recent move. It would be easy for me to surround myself with people my age, or in similar stages of life as me. We can commiserate over the parental pressures that still loom large in our lives. We can talk about the uncertainties faced by every twenty-something-year-old. We can fantasize about our first apartment or house. But I need more than just people my age. In Titus 2:3-5, Paul lays out a picture of an older woman teaching younger women Christian virtues. When I read that, I think to myself, I would like that—having the friendship of someone who has walked the paths I am walking, who can share of her wisdom. I have my mother, who is a solid Christian and is excellent at living out the Bible. And I have learned so much from her. But sometimes it’s nice to have a different voice. Someone I haven’t had over 20 years of experience ignoring. This means that I would need to move beyond my comfort zone. At church, I would need to talk to people I am not naturally drawn to. I need to share honestly my experience and worries. Because why would someone open up to me if I do not open up to them first? Not everyone I talk to will become a mentor or teacher. That’s okay. If I persist in building relationships, eventually some will bear fruit. I look forward to being discipled, so that I may in turn disciple others. Like I mentioned earlier, I am settling into a new church. The church is just big enough that I may slip through the cracks of serving without drawing much notice. I’ve never liked serving in church. I’m shy and for the most part am intimidated by the idea of having to interact with people. When asked about my spiritual gifts, I shrug and smile self-deprecatingly. But this is to be my spiritual family. Christ called me to love these people (John 13:35). He even showed me how to love them by setting an example and washing the feet of His disciples (John 13:15). “Each of you should use whatever gift you have received to serve others, as faithful stewards of God’s grace in its various forms” (1 Peter 4:10). I don’t really know what gifts I have. I like reading. I like in-depth study of the Bible. But how can I use these skills to serve my brothers and sisters in Christ? Especially when I don’t particularly like interacting with people? I’ve come to the conclusion that there’s only one thing to do. Look around to see what opportunities there are to serve at my church, and try serving for some time in one position or another until I find one that fits. Not necessarily one that I like immediately, but one where I am doing what the church needs to be done, and that few other people are able or willing to do. By God’s grace, I will learn to like it and will flourish in service to my brothers and sisters in Christ. In our twenties, we usually start earning some sort of income. The hope is that as we approach 30, our income becomes more stable and we will be more able to support ourselves and our families. But you know what’s more important than earning an income? Giving it away. Paul urged the Corinthians, “Each of you should give what you have decided in your heart to give, not reluctantly or under compulsion, for God loves a cheerful giver” (2 Corinthians 9:7). It’s not easy to give cheerfully. I worked hard for what little I have. Why should I give it away? Or take my current situation as an example. My husband and I are only making a portion of what we need (which is why we’re living with the parents for a season). Surely, it would be more responsible to save up so we could move out sooner and be less of a burden to others? While our finances are not quite where we want them, we are practicing reliance on God, and trusting that He will make good on His promises and give us what we need for good works. We strive to give regularly at church (and fail at times) because we trust that God will take care of us in all our needs. And because we need to be reminded, week after week, that God is the one who gave us everything that we have. All our money, time, and talents belong to Him. What are some things you hope to do before turning 30? Seven-year-old Jaydan and his sister Micah, 5, bounded down the streets of Downtown Eastside in inner-city Vancouver. Those who were using drugs started keeping their needles. Those who were fighting and swearing immediately quietened down. But Jaydan’s eyes were sharp. He saw a needle packet discarded at the foot of a fence and pointed it out to his sister, who shrunk back in mock horror. Jaydan and Micah are children of Craig Greenfield and his Cambodian-Chinese wife Nay, both 43. The parents were not afraid of bringing up their young children in the midst of drug addicts or former convicts. In return, the community was transformed by the presence of the children and altered their addictive behavior. Back in 2005, the family had moved into one of the poorest areas in Canada, where they began a radical social experiment by opening up their home to people struggling with homelessness, prostitution, and drug addiction. Before moving to Canada, Craig had grown up in affluence in New Zealand. There, he had met his wife Nay, a refugee from the Khmer Rouge regime. After marrying, both of them had answered God’s call to serve and live alongside orphans in slums in Cambodia for seven years. They had made their home in two different slums there. Jaydan was conceived in one and raised in another, and Micah was also born in the second slum. Craig and Nay then felt led to apply what they had learned in the Asian slums to an urban area in an affluent, Western country. While it seemed to be the exact opposite of where they had previously served, they saw that inner-city Vancouver had its share of physical and emotional poverty. There was rampant drug addiction, it had the highest Human Immunodeficiency Virus (HIV) infection rate in the Western world, and four in five people lived alone. So, instead of handing out donuts in a charity line, he and his wife went to line up with everyone else to get the free donuts. As they got to know people, they invited them back to their home for meals or for a temporary roof over their heads. This was the basis of their Christian community, called Servants Vancouver which they founded. The Greenfields now have two adjourning houses and two apartments. At any one time, they can house up to three families, four singles, and five children. “When people laugh together, do the dishes together, work together, play together, share lives together, we believe that there is something transformative about that,” says Craig. In such a community, the children bring joy and companionship to the singles or drug addicts who have had their own children taken away from them. The adults are less inclined to indulge in addictive behaviors in front of the children, and become mentors to the young charges. “We want to practise radical hospitality, welcoming those who are not normally welcomed in this society, into our lives, into our homes, into our families,” says Craig. One of the lives that was impacted by such a community was John, a former gang member who had been in and out of prison. He found a place where he was safe and able to stay clean from drugs, as well as a church family. “My kids walk down the street and they see a guy lying there in the gutter like a down-and-out person, and they have no illusions on what drugs do to a person,” he adds. The Greenfields continued to reach out to the drug addicts in the community for six years, giving them a place to detox and get back on their feet. Many of them needed a refuge while waiting to get into drug treatment centers, which had long waiting lists. In 2012, a serious brush with cancer led Craig to think about what he wanted to spend his final years doing. Knowing that each of the men and women struggling with addiction, homelessness, or prostitution had started out life as a child longing for someone to love them, he decided to work with children, to try to address the problem at the roots. So, in 2013, the family moved back to Cambodia, as they felt God’s leading to re-engage directly with the needs of the world’s poorest and most vulnerable children in the developing world. (From left) Nay, Micah, Jaydan and Craig. It was a return to the place where Craig had first discovered the value of setting up a Christian community. His calling to the urban poor in Cambodia grew from a short-term mission trip in Phnom Penh which he did during a six-month break from university in New Zealand. Craig, who majored in commerce, had been raised in a Christian family who freely opened their doors to the vulnerable in society. 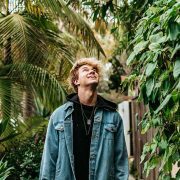 During the mission trip, young Craig befriended people who were dirt poor and homeless and were not interested in an abstract theology that seemed to be disengaged from their physical needs. “I am very poor. 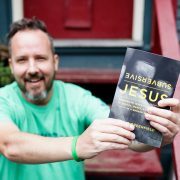 What can Jesus do for me?” one of them asked Craig. Those letters haunted the young man. “When I was growing up, those letters were etched into fluorescent green rubber wristbands sold in Christian bookstores or printed on the front covers of upbeat Teen Bibles. But I had never seen those letters on the tattered T-shirt of a beggar,” he says. Shortly after graduation, Craig met Nay at a church gathering and married her. Nay knew that one day she would go back to her home country and help her people. Similarly, Craig remembered the first stirrings to fulfill the Great Commission in Cambodia that God had placed in his heart during the mission trip. After some deliberation, he quit his job as a corporate executive in a successful technology start-up, and both of them moved into an impoverished Cambodian slum community called Victory Creek in 2002. Their aim was to serve Jesus by serving those in the “distressing disguise of the poor”. A two-room shack, barely tall enough to stand upright in, with only one window and one door to let light in, was their castle. 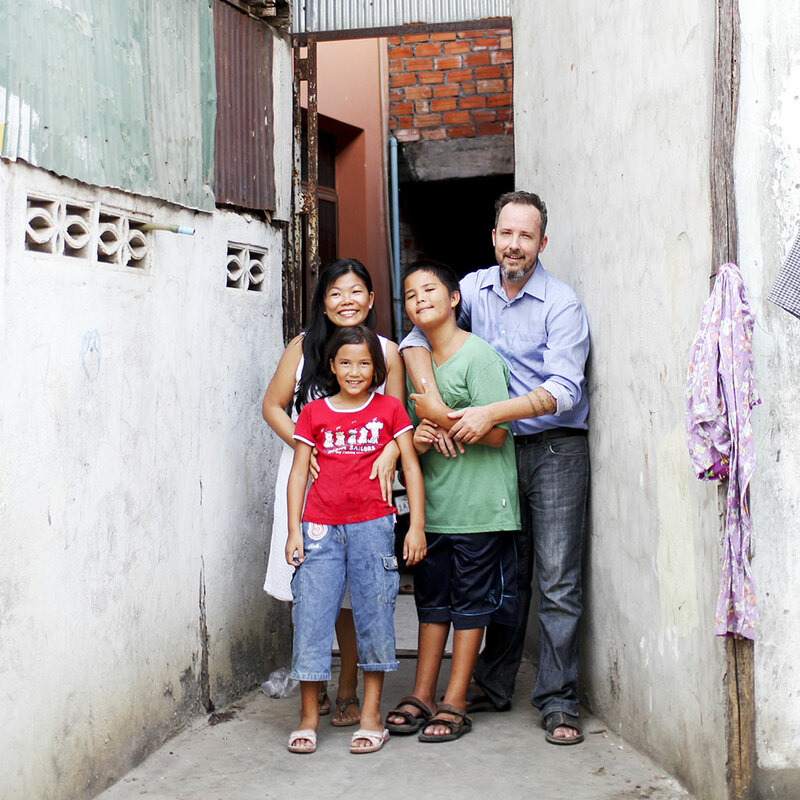 Craig and May lived alongside the poor, listened to their concerns, and tried to meet their needs. In their time there, they realized that many children were put in orphanages because their parents had either died from Aids or did not have the resources to raise their children. In his work with international humanitarian workers and consultants there, Craig learned that orphanage care could actually be harmful for the children. For instance, research has shown that institutional care has a negative effect on the psycho-social development of children. It also fosters a sense of disconnectedness, as the community is not involved in the care of the orphans. So Craig developed a ministry to help Cambodian communities care for their own orphans, and it eventually reached out to hundreds of vulnerable children and sparked a mentoring movement called Alongsiders International. The basic concept of Alongsiders is getting extended family members or local volunteers to foster or mentor orphans in their midst. “Cambodians have a proverb, ‘It takes a spider to repair its own web’. Our growing conviction as outsiders is to equip the locals or insiders to become alongsiders in journeying through life with the vulnerable in their society,” says Craig. He has seen orphans who had benefited from the love and support of others become “wounded healers” and extend the same love and support to others. Today, the Alongsiders movement has spread into many provinces of Cambodia, as well as India, Indonesia, Pakistan, Myanmar, and beyond. Description: When we talk about community, the first thought that comes to mind is always fellowship. But it’s so much more than that. Community gives us a platform to encourage–and in turn be encouraged–in the faith. It opens up opportunities for people to walk alongside us, help us mature in Christ (Ephesians 4:13) and simply to do life together. 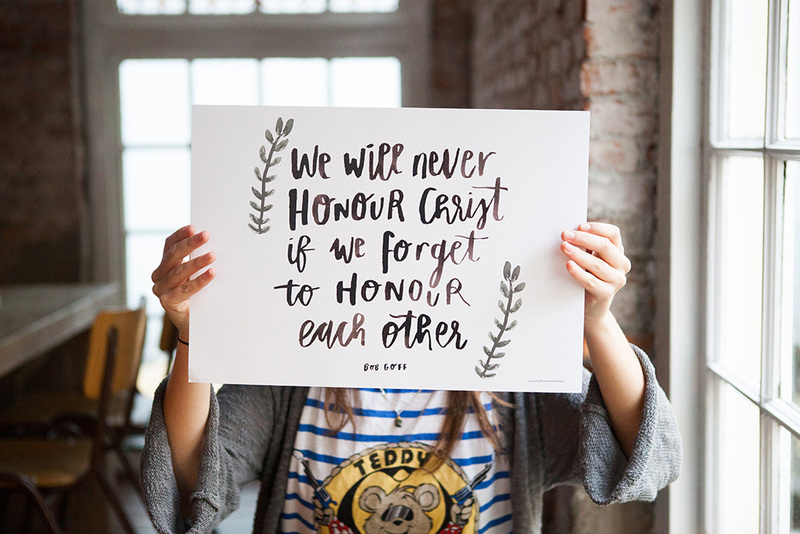 These posters were created by and plastered throughout the guesthouse of YWAM (Youth With a Mission) Amsterdam to remind us how we can embody Christ in our relationships by encouraging others with God’s promises. The Bible never promised that life as a Believer would be easy. In fact, He told us to not only expect moments of great joy and peace but also troubles and trials. 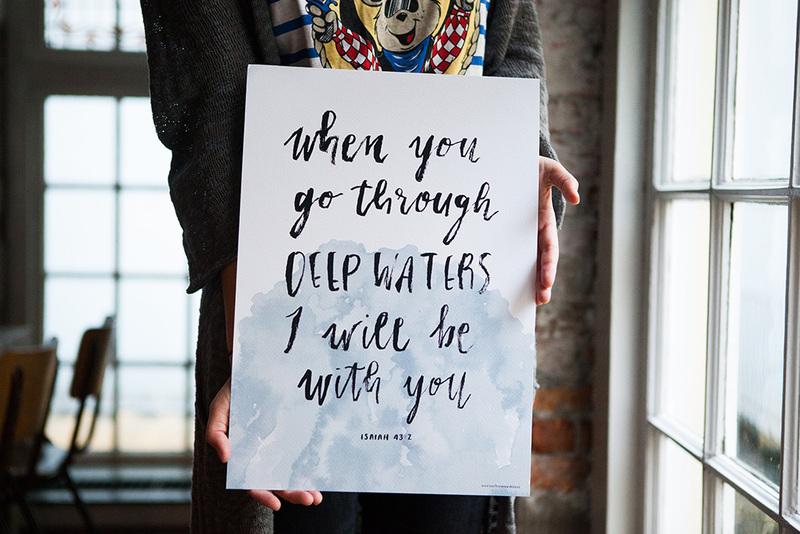 However, God gave us a community to stand by us and uses them to constantly remind us that He is always with us. 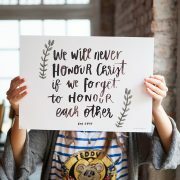 Be devoted to one another in love and honour one another above yourselves (Romans 12:10) When we honor others made in His image, we are honoring the Heavenly Father.